Published on 13 November, 2009 in FOSS. 0 Comments Tags: Linux, stability, stable, suggestion, testing, ubuntu, update. I have written a new article to follow up my previous (admittedly strongly worded) article on Ubuntu, with the two suggestions posted on my blog recently. I have no delusions that it will make any difference what-so-ever, but hopefully it’ll get people thinking about the issue anyway..
Karmic upgrade, broken printing. Workaround. Published on 10 November, 2009 in FOSS. 5 Comments Tags: broken, karmic, print, update, upgrade. So on another machine (my Dad’s to be exact) after an upgrade to Karmic, both sound and printing were broken. I fixed the printing issue last night, which was truly strange. The original printer was still there (as I would expect) and could be seen in the GNOME print manager. The problem was that it just wouldn’t print at all. Taking a closer look, for some reason the driver had been reset to “Alps MD-1000” even though it’s a Samsung. 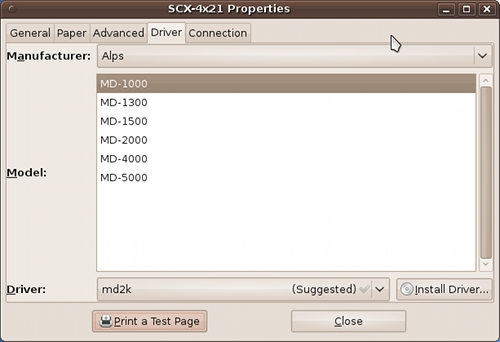 Changing the driver to anything else and saving the changes did not actually change the driver – it went straight back to “Alps MD-1000.” Adding a new printer resulted in the same problem. The fix was to log into the CUPS server directly (http://localhost:631) and from here I was able to select the right driver – and it stuck. It could now print correctly. Going back to the GNOME print manager still shows the driver as being the “Alps MD-1000” which is just wrong. So I’m not sure why GNOME print manager is broken, but if I configure the printer directly with CUPS it works. Published on 8 October, 2008 in FOSS. 0 Comments Tags: gnome, Linux, opensuse, package, suse, update. This morning I turned on my openSUSE work machine and was greeted (as I often am) with a message to update the system. Today’s message was special however, and perhaps one for The Daily WTF. Still, it seemed pretty important so I did it straight away! P.S. If you’re wondering what awesome icon set I’m using, it’s Oxy-GNOME. The Just another Linux geek archives for the update tag.